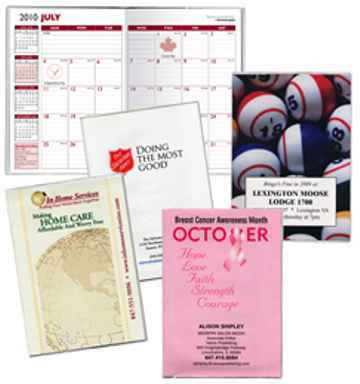 Paper Insert Desk Planners in Bulk -Photo Planners. Inexpensive, Promotional. : Monthly Photo Desk Planners and Academic Photo Desk Planners. Union Made in the USA. Bulk paper or photo insert desk planners of 2 types: calendar (January to January) paper insert planners and academic (July to August) paper insert planners, at unbeatable prices: Budget Prices for USA, Canada for wholesale photo insert desk planners. Union Made in USA. Free artwork design. We will send you a proof for your approval before production. This NEW 7"x10" high-tech digital custom Monthly or Academic Planner is a clear standard vinyl cover with your custom digital art inserted. It is a great way to advertise your business at an affordable price and see an impact all year long. Customize your cover any way you want: send us full-color high resolution digital art on disc or e-mail, being sure to account for the full front and back cover. The price is the same for both the calendar desk planners and the academic desk planners. Unit prices below include your full color imprint on both sides. PRODUCTION TIME: 5-10 days after art approval. Calendar Planner : January to January. Academic Planner: July to August. PRODUCTION TIME: 5-10 working days after art approval.